Those that follow our blog will know that one if the things that I have found painful finding made in Britain is tools, of any sort. Remarkably, for me, I have gone without restocking my workshop/man-cave/shed for all of this time… until this weekend. 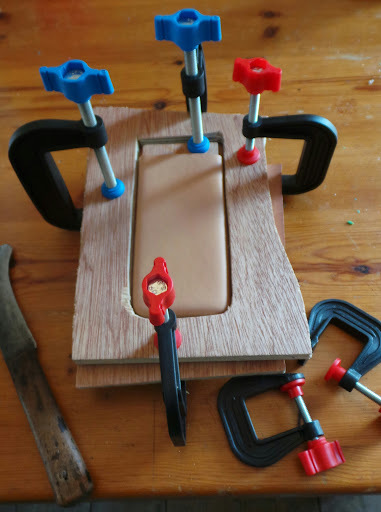 I needed some new g-clamps for holding some of the leather work I am currently producing and selling through Folksy. Not expecting to find anything, I spent a whole evening trawling the net and eventually found Linic (http://www.linic.co.uk). They make small moulded plastic tools and accessories, including a range of clamps. I bought 6 different sized clamps for just £5, which is pretty good value. Yes, the clamps are pretty light-weight but they are perfect for what I am going to use them for. One thing to note though is that this business suffers from the same level of poor marketing that I am becoming all to accustomed to seeing. I found them only after about 3 hours of trawling the net for them, they sell only through Ebay (I had to call them) and their website is like it was built in 1992. I see these issues all too often and am genuinely tempted to call them and say that I will sort these issues out for them. As a professional marketing-guy I would do it for free, it annoys me that much! Anyway, I have now had my fix of tool buying for now, but it will not be long before I need another hit. Record make G clamps see http://www.recordpower.co.uk/category/g-clamps. They are due to move to bigger works due to increased sales! Nice find Steve. I really like their sanders… but I suspect they are made in the Far East. I will have to call them to find out what they make here. They used to say Made in England on one side and Record on the other. Last for years. Hi – it is nice to hear from the manufacturers directly. Keep up the good work! Isobel Why don’t you put some factory photos or a video showing the factory on your website? Also, On your Proops Brothers website, some of the stuff you sell there you do not manufacture yourselves, and is really poor quality, eg the files, and the waterstones. You should stop selling those as they are bad for your reputation. Try Bahco files, those are very good. see if you can contact their supplier and see if you can get them to supply you as well. A site is needed listing goods made in the UK, also manufacturers need to make it clear where goods are made. emailed Fox’s biscuits because there was no country of origin (they ARE British. Camp coffee used to say Made in Scotland, it now says Made in the EU – not good enough unless they moved abroad and wanted consumers to thing it was still made in Britain. There are a number of sites that list companies that make goods in the UK: Kimwetu and Make it British both have extensive directories. I share James’s frustration with websites that are a bit “dog-eared”. Some smaller businesses seem to find setting up a webpage too costly/intimidating and consequently are so difficult to find. Many have set up a webpage and then not updated it when they create Facebook and Twitter accounts. Some will also have extensive text on the creative journey and ethos behind their product but forget to mention that they make it in the UK! There are almost 3000 companies on the Kimwetu website – with each one, they explicitly state on their website that they make in the UK or have emailed me to say so. I so understand the frustration. I’ve just bought a little pvc apron for my toddler from JustWipe. The apron says made in the UK but it’s not at all clear on the website. I look forward to checking it out!! !